This DVD contains unabridged MP3 recording of Aristophanes' Birds. Dr. Stephen Daitz, Professor Emeritus of Classical Languages, City University of New York, recorded nearly 70 hours of readings in the restored pronunciations of Greek and Latin for The Living Voice of Greek and Latin Literature series, including two masterpieces, the unabridged Iliad and Odyssey. The readings, available as MP3s, incorporate the restored historical pronunciation of Latin and Greek, following the scholarly conclusions of linguists and metricians. Each reading in this series is accompanied by the original Latin or Greek text and a facing English translation in PDF so students can follow along. 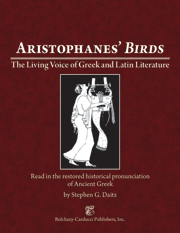 NOTA BENE: All of the Living Voice of Greek and Latin Literature recordings by Dr. Stephen Daitz are also available for download.